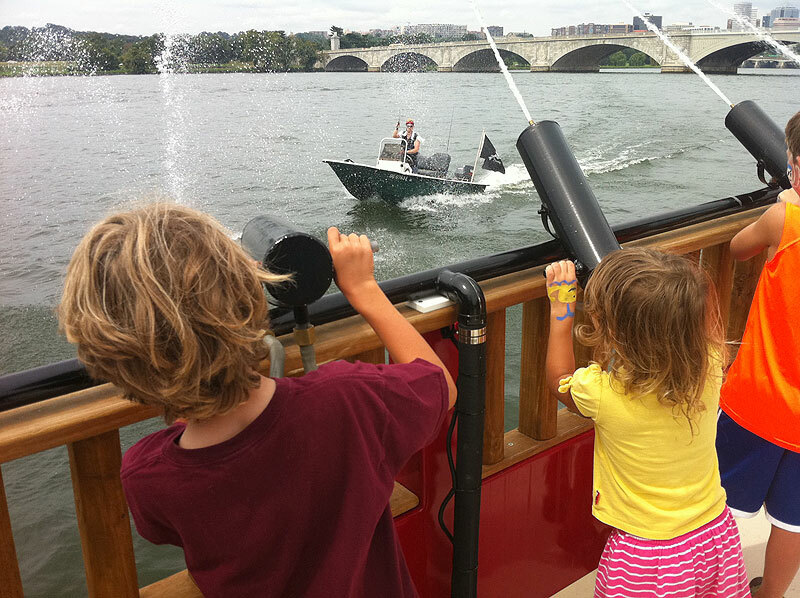 Pirate cruises on area waters are not a new thing for the kids and me, but they are for Washington, DC. Before this spring, adventures on the local high seas required a jaunt out to Annapolis or up to Baltimore. 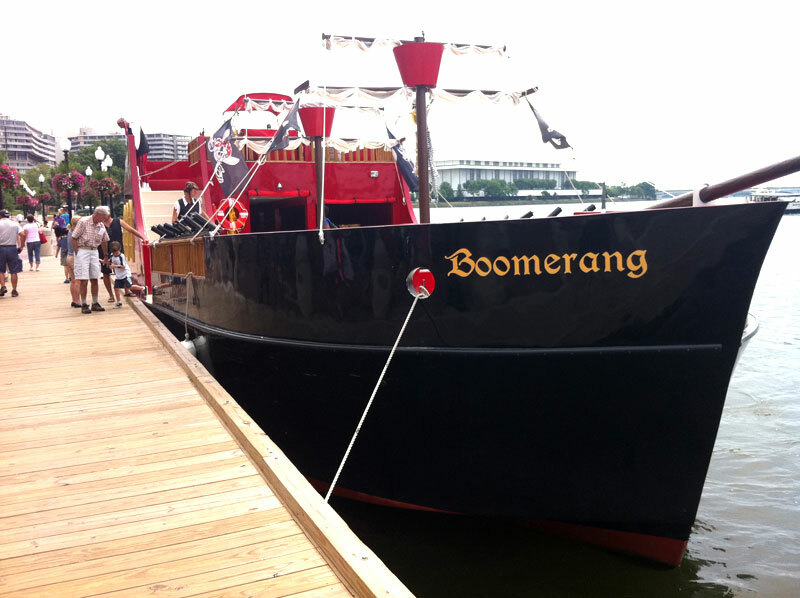 But thanks to the new Boomerang Pirate Ship that sails out of Washington Harbour in Georgetown, buccaneer excursions on the Potomac are accessible right in our backyard. So, I savored a brew while the kids had a hoot shooting water at the scurvy dog pirate who’d swiped the key to the treasure chest. Once the key was back in the hands of our pirates, the chest was unlocked and all of the little swashbucklers on board got to pick some loot for themselves. When the cruise ended after a bit over an hour, everyone was happy. And I don’t just mean my little crew; all on board the Boomerang seemed like they had a jolly good time (including those who’d passed on grog). But, really, how could we all not? The kids had a great adventure on the “seas” and the adults enjoyed a pleasant cruise on the river. And I’ve got to give props to the Boomerang crew, who really bolstered the whole experience. They stayed in character during the entire trip and were friendly, spunky and fun. 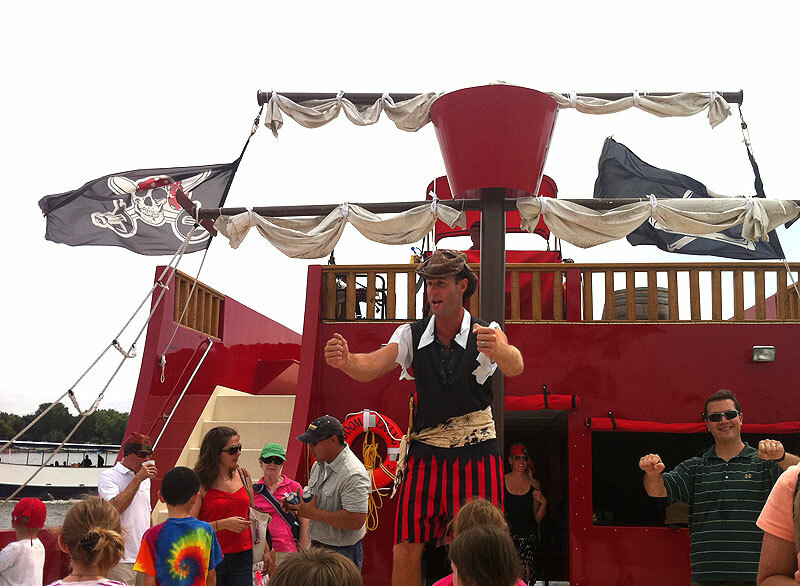 (Really, how many adults do you know who will dress as pirates and lead a large group of strangers in a dance?) Kudos to them. So, the logistics: Boomerang Family Fun Treasure Hunt Cruises set sail every weekend at several times throughout the day, with open dates currently available through most of October, plus there are still a couple of weekdays with sail times left this summer. Tickets are $20/person, but Certifikid is still offering their deal for $12 tickets, and many of the other deal sites have discounts as well. It is recommended to book in advance, as many cruises sell out. However, you can try your luck and head there day-of (like we did); if the ship is not full or there is a no-show, they may be able to get you aboard. I also recommend reading the FAQ page to help you plan. Hi, I would love to be part of your mailing list! I really enjoy your website! Hi Gabriela – I just added you. A confirmation email should arrive soon. Thanks for following! We are going Friday as our farewell to summer outing!! 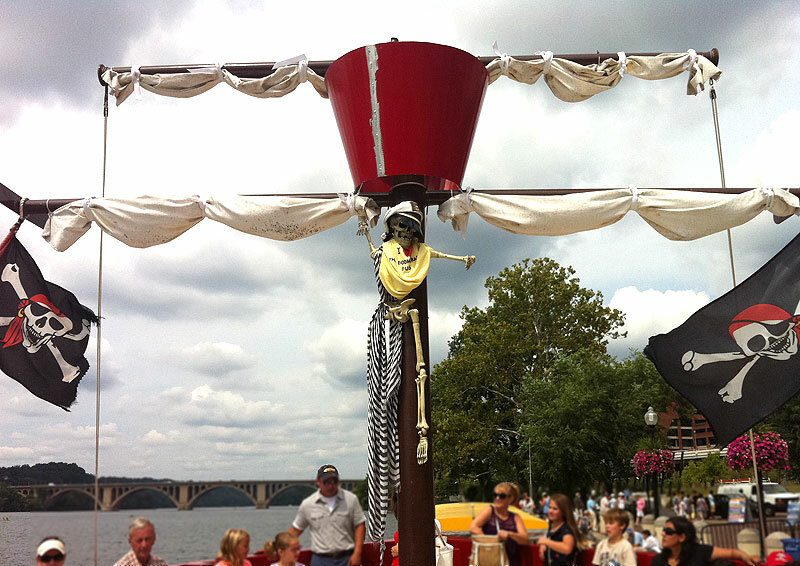 Is it located right where the ferry is to Old Town is an all the other Potomac Cruises? Right at the Harbor? Hi Carrie – Yes, right at the Harbor. You’ll see the pirate ship docked right along with the rest of the boats. Have a great time! Hello, I want to take my son on this ship for his 8th birthday. Where do I go to buy tickets? I am looking to go Saturday, October 18th. Hi Lady – Tickets are for sale here: http://www.zerve.com/boomerang/pirate. However, it looks like they are not offering the Family Cruise on October 18, only the evening party cruise for adults. 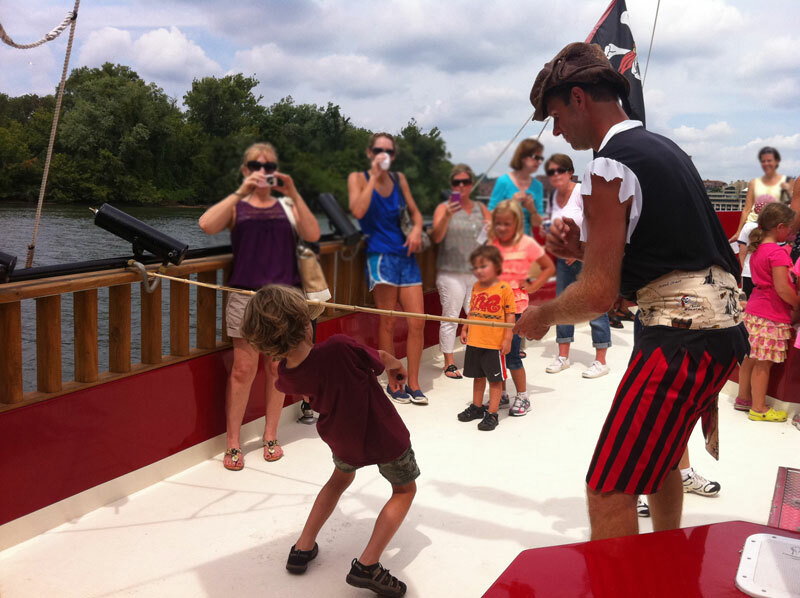 You might try Pirate Adventures in Annapolis – it’s the same idea, just on the Chesapeake. You can read more about it here: http://kidfriendlydc.com/2012/07/26/pirate-adventures-annapolis/. Hope your son has a great birthday, whatever you do!